Whether it&apos;s via the solar panels on the new house across the street or the special "green" edition of your favorite design magazine, sustainable design is helping shape the built environment. Accompanying this eco-awakening is an equally significant but lesser-known movement, biophilic design, an outgrowth of E.O. Wilson&apos;s 1993 book, The Biophilia Hypothesis. In it, the Harvard entomologist theorizes that because humans evolved in nature, they are inherently imbued with "biophilia," or love of life, and tend to seek out and thrive in surroundings that mimic the natural world. Implementing biophilic design is more complex than simply putting some flowers in a room or skylights onto a roof, but there is no definitive, step-by-step guide to its practice. As the science validating this emerging paradigm broadens and deepens, however, certain design practices are starting to be codified. Stephen Kellert&apos;s Biophilic Design: The Theory, Science and Practice of Bringing Buildings to Life, published earlier this year, brings together biologists, ecologists, psychologists, architects, designers and city planners to probe the confluence of people, nature and design. A professor of social ecology at Yale and co-editor of The Biophilia Hypothesis, Kellert says that although formal guidelines are evolving, he can delineate more than 70 attributes of biophilic design. These include environmental features like natural materials and plants; natural shapes and forms, including botanical motifs; and evolved human-nature relationships, such as prospect (the ability to discern distant objects) and refuge (the ability of an environment to provide security). Kellert says that although humans tend to measure progress in terms of removal from nature, most of human existence has required fitness and survival in natural systems. Though the data are still coming in, study after study outlined in Biophilic Design demonstrates that natural experiences, whether real or symbolic, evoke positive responses in human beings. For example, a widely cited 1984 study found that recuperating gallbladder patients exposed to a natural window view instead of a brown brick wall required fewer painkillers, logged shorter postoperative hospital stays and had fewer minor complications. "Whether you&apos;re an investment banker working in lower Manhattan or someone working the land, nature still confers all kinds of advantages if you depend on intellectual prowess, a healthy emotional response, physical health or critical thinking skills," Kellert says. So far, biophilic concepts have been largely absent from the sustainability conversation. Judith Heerwagen, an environmental psychologist and co-author of Biophilic Design, says one obvious reason is the focus on resource efficiency and technological innovation, which don&apos;t in and of themselves require reflections of nature. Also, she says, there has traditionally been poor communication between architects and the social scientists who have conducted most of the research on biophilic design. But as obscure as the field may appear to some in the green movement, Heerwagen believes biophilic design to be best understood as "the missing link" in sustainable design. "It&apos;s not just our impact on the environment which we clearly need to address; it&apos;s trying to understand the beneficial impacts of the natural environment on humans and how to integrate that thinking into sustainability," Heerwagen says. Imagine a condominium made entirely of solar panels. Such a structure might have a small ecological footprint, but it will fail to tap into a resident&apos;s aesthetic tendencies, much less his "love of life." Worse, Kellert says, it will ultimately be unsustainable. "If it&apos;s a place that doesn&apos;t breed satisfaction, enhance morale or motivate people (and in fact alienates them)," he says, "when the cutting-edge technology that made it energy efficient is no longer cutting edge, and people don&apos;t want to be there, they won&apos;t sustain that environment." At the other end of the spectrum are classics, like Frank Lloyd Wright&apos;s Fallingwater — the country home in Pennsylvania built over a waterfall — that are biophilic but not particularly green. Not only is the home wasteful of materials, Kellert says; it is harmful to the surrounding ecosystem because it&apos;s built inside stream corridors. There is a middle ground, Kellert says, that melds biophilic principles and low-impact design into what he calls restorative environmental design. In so designing, architects and designers respect a structure&apos;s environmental context in search of "true sustainability." A good example is Civano, a 9-year-old planned community in Tucson, Ariz., that combines low-impact building materials and water conservation technologies with native plants and aesthetically pleasing, Southwestern-style homes. Beyond setting aside 35 acres for open space, Civano integrates community orchards, linear parks, bike paths, pedestrian trails and preserved desert wildlands within its borders. What&apos;s more, landscapers were able to salvage and replant approximately 65 percent of the native trees and plants originally on the site, helping preserve its Sonoran Desert ecosystem. 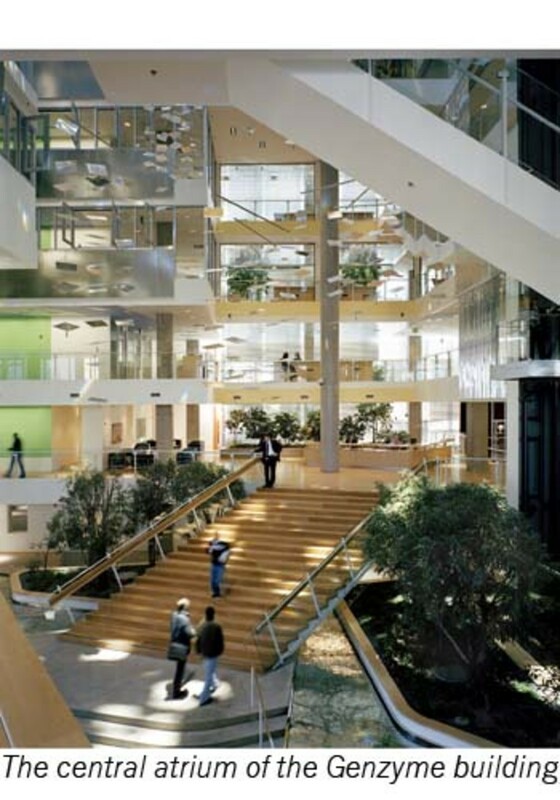 Among restorative environmental designs set in urban areas, Kellert gives high marks to the Genzyme building in Cambridge, Mass. Its central atrium and a natural light-enhancement system allow 75 percent of its employees to work without artificial lighting. Water-saving technologies, including water sensors in the landscaping, reduce water consumption by 34 percent compared to conventional office buildings. Moreover, Genzyme&apos;s green roof mitigates the heat-island effect of standard asphalt roofing, while 18 interior gardens help bring the outdoors inside. And because the building provides prospect (through views into its central atrium) and refuge (in the form of overhangs that help workers feel sheltered), worker comfort, morale and productivity are all enhanced, Kellert says. Still, most work spaces are, in biophilic terms, "appalling," according to Heerwagen. "Walk into any office and you see just rows of gray or beige cubes," she says, even though improvement wouldn&apos;t require great outlays of money. Just lighting the walls, she adds, can create a feeling of big-sky country that attracts most people. Heerwagen admits that data supporting a link between biophilic design and increased productivity are sparse, with positive outcomes demonstrated mainly in laboratory settings. "We haven&apos;t found it in real work environs, though there was some work done by Lisa Heschong," she says. Heschong, a Northern California architect, examined the influence of daylight on worker productivity at the Sacramento Municipal Utility District. Her 2003 study, "Windows and Offices," a report for the California Energy Commission, found that workers in a telephone call center processed calls 6 to 12 percent faster when they had a view. A second investigation at a separate facility demonstrated that employees performed 10 to 25 percent better on tests of mental function and recall when window views were available. Perhaps the best-documented example of restorative design&apos;s potential can be found in hospital settings. Roger Ulrich, the psychophysiologist who conducted the 1984 study of gallbladder patients and their views outside, first became interested in "evidence-based health care design" in the 1970s while investigating nature&apos;s role in reducing stress. "I asked myself, ‘Where are the groups in society that are experiencing a great deal of stress or duress? Where might exposure over a period of time to nature be especially beneficial and show up in improved health in a hard medical sense?&apos;" Ulrich recalls. By the late 1980s, architects were already starting to consider the findings of Ulrich and other researchers in planning their hospital projects. With its views of trees and plants throughout the facility, the Lucile Packard Children&apos;s Hospital in Palo Alto, Calif., constitutes an early example of biophilically inspired hospital design. Others include Bronson Methodist Hospital in Kalamazoo, Mich., which has an indoor garden, and Christus Saint Michael Health System, a hospital nestled in the woods of Texarkana, Texas. But restorative hospital design is not just helpful for patients. The Children&apos;s Garden at Legacy Emanuel Hospital & Health Center in Portland, Ore., was conceived with pediatric patients and their families and hospital staff in mind. In fact, a variety of studies have found that the most important benefit of hospital gardens was recovery from stress — for all users. Ulrich says recent investigations have even connected mere representations of nature to pain relief. A 2003 Johns Hopkins study of patients recovering from bronchoscopy found that a recovery room containing a large image of a brook, flowers, green grass and distant mountains, accompanied by audio of flowing water and birds, substantially reduced the pain reported by patients, with no negative side effects. And Japanese animators have developed a virtual-reality "walk through the woods" that, Ulrich says, has been shown to relieve distress in women undergoing chemotherapy for metastatic breast cancer. Ulrich is not suggesting the elimination of living plants and trees in the hospital setting. "But for short-term applications for 15 or 20 minutes, there&apos;s no question that these simulations, particularly if they&apos;re more immersive and multisensory, have quite a bang in terms of improving outcomes like pain," he says. The increasing scope of evidence-based hospital design is one indication of biophilic design&apos;s growing relevance. Part of that relevance derives from economics. "If you design the hospital correctly, with measures such as using nature to reduce pain, you&apos;ll reduce the operations cost of delivering care over the life of the facility," Ulrich says. "It may cost a bit more initially, but not doing so would be irrational from a business standpoint." The American Institute of Architects&apos; minimum code for design and construction of health care facilities now requires providing window views of nature, natural light and natural gardens. Even so, biophilic design criteria have yet to be incorporated into the most widely recognized yardstick for sustainable design, the U.S. Green Building Council&apos;s Leadership in Energy and Environmental Design certification system. If biophilia finally makes it into LEED — and there are indications that it will —architects, designers and city planners will have a new tool for bridging the gap between what passes for green and true sustainability.